Score another knockout for prehistoric animals. 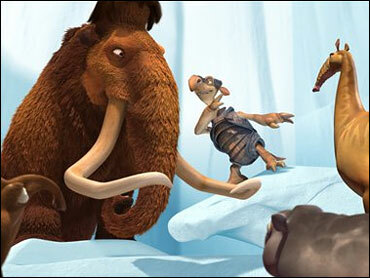 The 20th Century Fox family tale "Ice Age: The Meltdown" took in $34.5 million to remain the No. 1 movie for a second straight weekend, according to studio estimates Sunday. The animated sequel fended off Sony's Rob Schneider-David Spade baseball comedy "The Benchwarmers," which debuted as runner-up with $20.5 million. Premiering in third place was New Line's "Take the Lead," a ballroom dance tale starring Antonio Banderas that took in $12.8 million. The Weinstein Co. crime romp "Lucky Number Slevin," starring Josh Hartnett, Bruce Willis, Morgan Freeman and Ben Kingsley, debuted at No. 5 with $7.1 million. Fox Searchlight's comedy "Phat Girlz," starring Mo'Nique as a designer of plus-sized clothes, premiered at No. 9 with $3.1 million. "Ice Age: The Meltdown," with Ray Romano, Denis Leary, John Leguizamo and Queen Latifah providing the voices of prehistoric creatures on the run from global warming, raised its 10-day domestic total to $116.4 million. It became the first movie released this year to cross the $100 million mark. While the first few months of the year are Hollywood's slowest, the industry usually has produced a $100 million hit by February or March. "This is a late bloomer," said Paul Dergarabedian, president of box-office tracker Exhibitor Relations. Still, Hollywood had another big showing overall, with revenues soaring for a second straight weekend. The top-12 movies took in $105.1 million, up 33 percent from the same weekend in 2005. "The Benchwarmers," about grown-up geeks taking on Little League baseball teams, did not screen in advance for critics, generally a sign the studio expects reviews would be bad. The handful of reviews that did make it out over opening weekend were generally poor, but "The Benchwarmers" managed a solid box-office batting average among its teen and twenty-something target audience, a group unlikely to seek out reviews for a lowbrow comedy. Bruer, head of distribution for Sony. Likewise, "Phat Girlz" did not screen in advance for critics, a practice becoming more common among studios. So far this year, 11 movies have not been shown to critics, compared to two during the same period in 2005. "The core audience of Mo'Nique fans is not really going to be affected by critics, and since there was a good chance we were not going to get favorable reviews, we didn't feel it was necessary to do that," Fox Searchlight head of distribution Steve Gilula said. Fox Searchlight did score with the well-reviewed satire "Thank You for Smoking," which expanded to its widest release yet and broke into the top 10. Playing in 300 theaters, up from 126 the previous weekend, the film took in $2.4 million to come in at No. 10. "Thank You for Smoking" stars Aaron Eckhart as a tobacco-industry lobbyist pulling out all the stops to encourage people to light up. The film expands to nationwide release in more than 1,000 theaters this Friday. In limited release, Sony Pictures Classics released Jennifer Aniston's comic drama "Friends With Money," which debuted strongly with $636,681 in 28 theaters. Aniston plays a woman scraping by as a housecleaner, to the consternation of her well-off friends (Frances McDormand, Catherine Keener and Joan Cusack). 1. "Ice Age: The Meltdown," $34.5 million. 2. "The Benchwarmers," $20.5 million. 3. "Take the Lead," $12.8 million. 4. "Inside Man," $9.2 million. 5. "Lucky Number Slevin," $7.1 million. 6. "Failure to Launch," $4.1 million. 8. "V for Vendetta," $3.4 million. 9. "Phat Girlz," $3.1 million. 10. "Thank You for Smoking," $2.4 million.